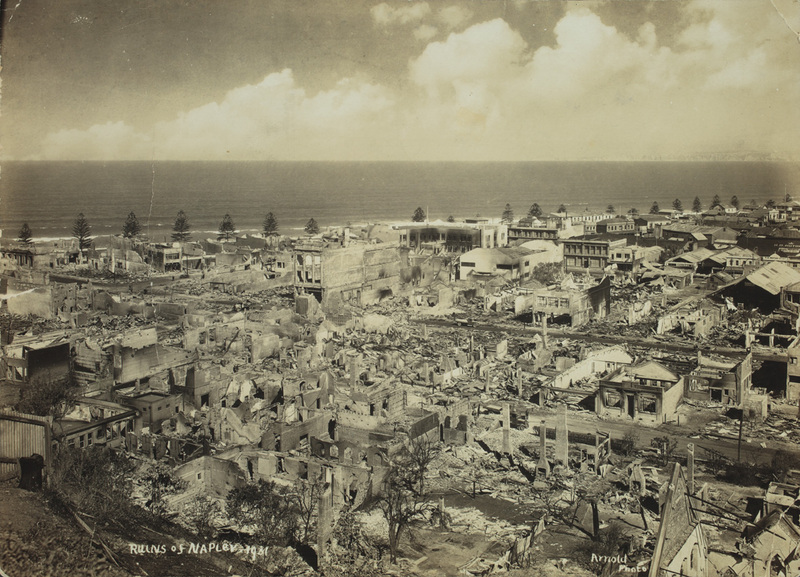 Eighty-six years ago today on the 3rd of February 1931 at 10.47 am, New Zealand’s deadliest earthquake struck the Hawkes Bay. Centered 15kms north of Napier, it lasted for two and a half minutes and measured magnitude 7.8. 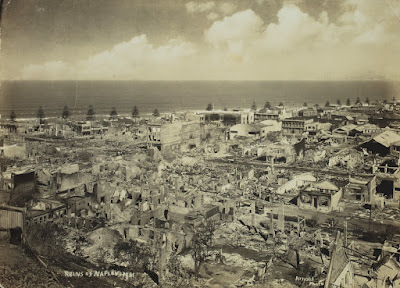 Napier was levelled and at least 258 people were killed. Thirteen-year-old Cecil O’Halloran and her sister Joy lived with their parents, Ivy and Kevin, on the Napier hills, in Brewster Street. Their house was built by Ivy's builder father, Thomas Bailey, as a wedding present for his daughter. When the earthquake struck, Ivy was at home. It was fortunate she'd just left the laundry for the kitchen as the only damage to the house was from the chimney crumbling down on to it. Auckland Libraries Sir George Grey Special Collections has digitised a view of the city taken before and after the earthquake. The house that Thomas built for Ivy and Kevin is in the foreground, second house from the right in the photos below. In the first one you can see it has a chimney, which has gone in the second photo. Meanwhile, Cecil and Joy were at school. At 13, Cecil was a bit too old to be on a see-saw but she was playing that game where you try to bounce the other girl off. To her indignation, Cecil was roughly thrown to the ground, soon realising that it wasn’t her playmate’s doing as the ground undulated beneath her. Her convent school survived pretty much intact but the nuns were sure it was more than an earthquake when they raced to the convent’s graveyard crying, 'Armageddon'! The girls had to camp overnight at school and it wasn’t until the next day, when her parents came to collect her, that Cecil realised that they too were okay. Cecil eventually died in her eighties from Alzheimer's but the Napier earthquake was one memory that lasted with her, almost to the end.